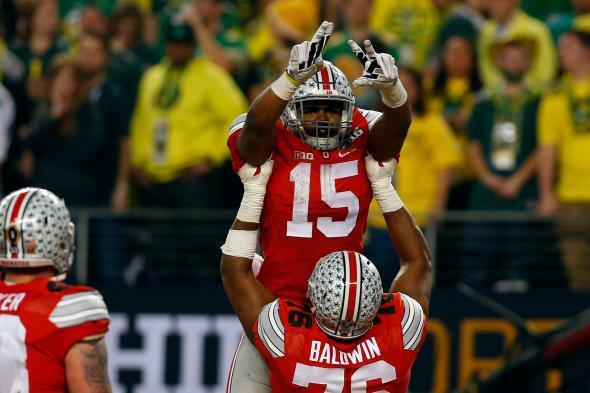 Ohio State beats Oregon in college football national championship. Running back Ezekiel Elliott #15 of the Ohio State Buckeyes celebrates after a touchdown run. Ohio State overcame four turnovers to handily beat the Oregon Ducks 42-20 and win the first (FBS) college football playoff on Monday night in Arlington, Texas. Ohio State’s offense, powered by running back Ezekiel Elliott, proved too much for the Ducks as the Buckeyes dominated time of possession. Elliott rushed for 246 yards and four touchdowns to give Urban Meyer his first national title with the Buckeyes—after winning two with Florida—and ended the Ducks’ pursuit of the program’s first national championship. Heisman Trophy winner Marcus Mariota got the Ducks out to an early lead, driving 75 yards to score in the game’s opening possession. The Buckeyes, however, quickly snatched momentum from Oregon coach Mark Helfrich’s breakneck offense, pounding their way to three consecutive touchdowns, building a lead the Ducks could not catch. Four early turnovers threatened to undo a solid performance from Cardale Jones, who made just his third career start in the national title game, but the Ducks ultimately couldn’t capitalize on the Buckeyes’ early miscues.